Bee Pollen – Used for centuries by different cultures around the world, it is one of the oldest health foods utilized by man as a dietary supplement and physical rejuvenator. Containing more than 96 different nutrients, it’s dust-sized seed is found on the stamen of all flower blossoms and collected by bees as they move from flower to flower. 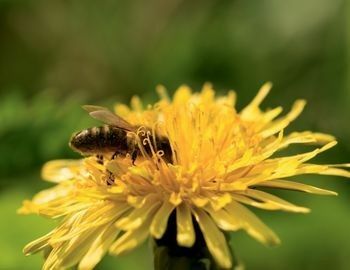 The pollen is usually collected by placing a special device at the entrance of beehives that brushes it from the hind legs of the bees into a collection vessel. Mixed with food or drinks, it is known as an energy source, can act as an appetite suppressant, improve sexual health, treat reproductive system problems, including PMS; aids digestion, strengthens the immune system, enhances memory and has also been known to help with hay fever. Use caution if you have not taken bee pollen before, as people who have found to be allergic, can have an anaphylactic reaction. Do not use bee pollen if you know you are allergic to bee stings. Beeswax – Taken from the honeycomb of bees, Beeswax has been used for centuries for all types of purposes, from embalming, to candles, ointment, cosmetic products and more. In fold medicine, it also formed the basis for many healing salves. Honey bees were introduced to North America in the early seventeenth century and Native Americans called them “white man’s flies,” since their presence indicated a colonist settlement nearby. However, the indigenous people of the Americas had utilized wild bees in their products for many hundreds of years. It was and still is used for making medical ointments, when mixed with herbs, and as a balm for burns. It is also said to dilate blood vessels, thereby improving blood circulation. Beeswax should only be used externally. It can cause blockage of the intestines of swallowed. Blackberry – Officially called Rubus Fruticosus, its root-bark and leaves, have long been used in the healing of a number of medical problems. Making a tea from the root is often used to sooth stomach problems, dysentery, and diarrhea, has been found to be helpful in reducing swelling, and stimulate the entire system. Externally, a decoction of leaves is used as a gargle to treat sore throats, mouth ulcers, gum inflammations, thrush, and as a general mouthwash. Black Gum – Scientifically known as Nyssa Sylvatica, this tree is native to eastern North America, from New England and southern Ontario south to central Florida and eastern Texas. It is also commonly known as Black Tupelo, Pepperide, or simply Gum or Tupelo. Its fruit, bark, and roots have been used by Native Americans as a bath, as well as in decoctions to induce vomiting, eliminate worms in children, and treat eye problems. 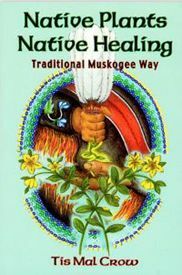 Cherokee healers used a mild tea made from small pieces of the bark and twigs to relieve chest pain. Black Raspberry – Formally known as Rubus Occidentalis, it is also known as wild black raspberry, black caps, black cap raspberry, thimbleberry, and scotch cap. Roots of the shrub, which are boiled into tea or chewed, have been found to be cathartic, and effective in the treatment of gonorrhea, cough, and toothache. They have also been used as a wash for sore eyes, ulcers, boils, and sores. The Pawnee, Omaha, and Dakota tribes boiled the root bark to treat dysentery. The highly astringent leaves have been used in the treatment of bowel complaints. A decoction of the roots, stems and leaves has been used in the treatment of whooping cough. Black Cohosh – Officially known as Cimicifuga Racemosa, this white-blooming plant from the buttercup family is native to the woodlands throughout Eastern North America. Also called black bugbane, black snakeroot, rattle weed, and fairy candle. Native Americans, including the Winnebago, Dakota, and the Oklahoma Delaware, were known to have used the root of the plant in teas to heal various problems including gynecological, sore throats,cough, headache, kidney problems and depression. The Cherokee, on the other hand, used the roots to make an alcohol beverage. Externally, the herb was often combined with others and blown over patients during rituals, and used in sweat baths. Today, it continues to be used for gynecological problems, including pre-menstrual tension and menopause, as well as arthritis, aches, colds, nervous conditions, respiratory ailments, Tinnitus, and Sciatica. Black Elderberry – See Elder. 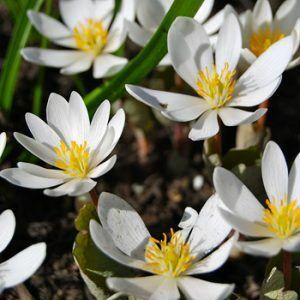 Bloodroot – Officially known as Sanguinaria Canadensis, it has also been called bloodwort, red puccoon root, Indian plant, pauson, and tetterwort. Indigenous to the hardwood forests of the eastern part of North America, the roots of the flowering plant have long been used in Native American medicinal remedies to treat respiratory and digestive problems, diphtheria, sore throat, bronchial problems, rheumatism, and used as a pain reliever and sedative. Externally, it was used for ringworm, burns, and as an insect repellent. Fresh roots were made into washes, poultices, snuffs, dental powders, and salves. Unfortunately, we now know that the plant is toxic as it produces morphine-like benzylisoquinoline alkaloids, primarily the toxin sanguinarine. It has been classified as unsafe by the Food and Drug Administration, as people in the past have died from over intake. It can also irritate mucous membranes and result in diarrhea, intestinal colic, vomiting, and total collapse. In the past, the red sap of the root were also used as a dye by many tribes and the Appalachia Indians were known to have carried as a charm to ward off evil spirits. Blue Cohosh – Formally called Caulophyllum Thalictroides, and also known as squaw root and papoose root, this flowering plant is found in hardwood forests from Manitoba, Canada and Oklahoma east to the Atlantic Ocean. Native Americans have long used the root in teas and tonics to treat rheumatism, dropsy, colic, cramps, hiccough, epilepsy, female reproductive issues, uterine problems, and to induce labor, and ease the pain of childbirth. Many Native American tribes and later, European herbologists and mid-wives, used Blue Cohosh in conjunction with other herbs and remedies for abortive and contraceptive purposes. Blue Spruce – One of the most popular ornamental conifers, the Colorado Blue Spruce is a truly magnificent sight with its silvery blue-green coloring and perfect Christmas tree shape. The Colorado blue spruce was first discovered on Pikes Peak in 1862 and its fame spread quickly. Today it is one of our most widely planted landscape trees . Not only is it beautiful but has long been used by Native Americans for healing purposes. The Navajo and Keres tribes used this tree as a traditional medicinal plant and a ceremonial item, and twigs are given as gifts to bring good fortune. Infusion of the needles in a warm bath is said to relieve the symptoms of rheumatism. Other parts of the tree have been used in the treatment of colds or stomach ailments. Spruce oil is derived from the bristly, needlelike, leaves and twigs of spruce trees, in which natives used in ointments and salves with honey, and alum to treat skin problems, such as boils, burns, skin inflammation, sores, and wounds. They also chewed the balsam of spruce as a chewing gum and spread it as caulking or glue. Its medicinal uses continue today in treating respiratory conditions, cuts, wounds, and swelling; pain associated with inflammation, bone pain and joint pain, and more. 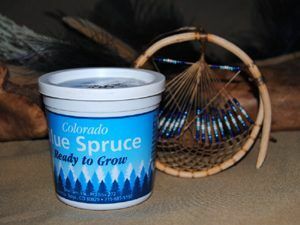 The various elements of Blue Spruce have also been used in households as a disinfectant, furniture polish, air freshener, and an insecticide. Boneset – Officially called Eupatorium Perfoliatum, is part of the aster family and contains up to 60 species. Native to temperate regions of North America, it has also been called ague weed, feverwort, thoroughwort or snakeroot. Though it has been found to be poisonous, it was used by the Iroquois, Delaware, Cherokee, Mohegan, and Menominee to treat colds and fever. The Alabama used it for stomach aches and the Cherokee, as a laxative. High in magnesium, calcium, niacin, and phosphorus, it has also been effective in the treatment of dengue fever, arthritis, certain infectious diseases, migraines, intestinal worms, flu, malaria, and diarrhea. Generally used in a tea, dried leaves rather than fresh leaves, will eliminate the potentially toxic chemicals. Caution is advised as the toxic compounds can cause liver damage. Side effects include muscular tremors, weakness, and constipation; and overdoses may be deadly. Boswellia – Also known as frankincense, Boswellia has been used for thousands of years. Native to India, it is a type of tree known for its fragrant resin which has many pharmacological uses particularly as anti-inflammatories. It has been used in the treatment of asthma, fever, rheumatism, gastrointestinal problems, depression, arthritis, inflammatory bronchial infection,jaundice, ringworm, skin diseases, syphilis, and stomach ache. It has also been used as an expectorant, antiseptic, to lower cholesterol, and reduce body weight. It should not be used by the pregnant, breast-feeding women and children. Broom Snakeweed – Officially known as Gutierrezia Sarothrae, it is native to the west and southwest portions of the United States, and is also simply called snakeweed. Southwestern Indians and Mexicans used it for multiple treatments. The Blackfoot boiled the roots and inhaled the steam for respiratory ailments, the Comanche used the leaves in a decoction for whooping cough. The Sioux used it for colds, cough, and vertigo. Others used the fresh flowers or roots for diarrhea, as bath for fever, as a poultice for bruises, sores, rheumatism. It was probably most widely used by the Navajo, who used it for headache, on wounds, applied it to insect stings and snake bites, utilized a decoction of the root for painful urination, stomachache, colds, fever, and promote the expulsion of the placenta after childbirth. If was often used as an ingredient in sweat baths and sweat lodges. Buck Brush – A common name for some 50-60 species of North American shrubs, it is officially called Ceanothus. The genus is confined to North America, the center of its distribution in California, with some species in the eastern United States, southeast Canada, and extending as far south as Guatemala. One species, Ceanothus Velutinus, was known as Red Root by many Native American tribes and was used for cysts, fibroid tumors, inflammation, and mouth and throat problems. Today, it has also been found to be effective in treating high blood pressure and lymphatic blockages. Another called Hummingbird Blossoms by the Cherokee was used for a diuretic to stimulate kidney function. Ceanothus Integerrimus has been used by North American tribes to ease childbirth. Ceanothus Sanguineus, commonly known as Buckbrush Chaparral or for treating inflamed tonsils, enlarged lymph nodes, non-fibrous cysts, enlarged spleens, menstrual bleeding, nosebleeds, hemorrhoids, and ulcers, as well as to relieve nervousness. Poultices were used to treat burns, sores and wounds. The Miwok Indians of California were known to have made baskets from Ceanothus branches and early early pioneers used the plant as a substitute for black tea. Buckthorn – A genus of shrubs or small trees in the Rhamnaceae family, they are native throughout the temperate and subtropical Northern Hemisphere, and also more locally in the subtropical Southern Hemisphere in parts of Africa and South America. Only the buckthorn bark is used for medicinal purposes. Known from the 14th century, Buckthorn is especially administrated as a laxative or purgative. It has also been used for liver health, for obesity, rheumatism, headache, allergies, hepatitis, intestinal worms, and skin diseases such as acne, eczema, and psoriasis. Buckwheat – Formally called Fagopyrum Esculentum, this plant is not a grain, but produces a fruit seed that is a great source of fiber, maganese and magnesium. Though it tastes somewhat bitter, it has long been used as both a food and in herbal remedies. It has been known to lower blood pressure and strengthen blood vessels and has been used to stop bleeding, treat diarrhea, dysentery, skin lesions, and a wide range of circulatory problems. 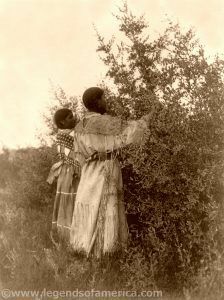 Mandan Women collecting buffaloberries. Edward S. Curtis, 1908. Click for prints, downloads and products. Buffaloberry – Officially called as Shepherdia, there are three species called Silver Buffaloberry (Shepherdia Argentea,) Canada Buffaloberry or Russet Buffaloberry (Shepherdia Canadensis,) and Round-leaf Buffaloberry Shepherdia Rotundifolia. These small shrubs with bitter tasting berries are native to northern and western North America. Also called soapberry, bullberry, rabbitberry, chaparral berry, silverleaf, and soopolallie, the berries and other parts of the plant have long been used as food, medicine, and dye. Of the three types, the Russet Bufalloberry had the most uses. Very often used for food, it was popular in the productions of “Indian ice cream,” which was a frothy desert made of hot water, buffaloberries, and sugar. It was also used for other beverages, preserves, porridge, sauces, dried cakes and more. Parts of the plant as well as the berries were used to treat constipation, tuberculosis, swelling, cuts, arthritis, venereal diseases, stomach troubles, fever, broken bones, mosquito bites, sore eyes, acne, boils, gallstones, toothache, headache, and a gynecological problems. Buffaloberries are edible, but quite sour, and afterwards leave the mouth a little dry. The berries are commonly eaten raw, but only after the first frost has naturally sweetened them, and then in moderation. Overindulgence can cause diarrhea and may be fatal. Burdock – Officially called Arctium Lappa, this plant is a member of the sunflower family, and is also known as Cocklebur and Bardana. Though it originated in Eurasia, it was adopted and used by Native Americans for centuries. Its roots have long been eaten around the world as a vegetable and has many medicinal uses in treatment gastrointestinal ailments and respiratory problems. Native American uses included crushing the roots and leaves for skin care, including sores and ulcers, and treating rheumatism by the Cherokee, Maliseet, Menominee, Micmac, and Chippewa tribes. The Iroquois were known to use the roots to aid in circulation and and to purify the blood. The Potawatomi also used it as a blood purifier and general tonic in teas. Rich in chromium, iron, magnesium, thiamin, phosphorus, potassium, vitamin A, and zinc, the Indians also utilized it as food, drying the roots to add to soups, and using the young leaves as greens. Many tribes also utilized burdock in ceremonial uses. This herb should be avoided if pregnant or nursing.